What Is Classic Outlook Integration? Before using the integration, you must first download and install the plugin for Sage CRM. For instructions and system requirements, watch this installation video. Once the plugin is successfully installed, a CRM ribbon will display in Outlook which provides access to the integration features. The ribbon allows you to file emails, add Outlook contacts to Sage CRM, initiate synchronization, and manage synchronization settings. 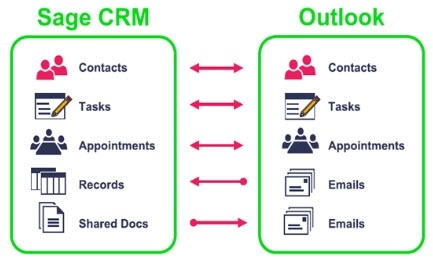 Depending on how you configure the integration, you can synchronize data from Sage CRM to Outlook only, from Outlook to Sage CRM only, or both ways. Watch the video onconfiguring Classic Outlook integration for guidance. The first thing you’ll do is to flag the Sage CRM contacts that you want to synchronize with Outlook. These contacts will then share data between the two applications and be included in all future synchronizations. Scheduling Appointments - create a new appointment in either Sage CRM or Outlook and discover that it’s in your calendar in both applications following the next synch. File Email - clicking “File Email” in Outlook will attach the message(s) to the “Communications” tab for the contact in Sage CRM. Attach Shared Documents - attach documents from the “Shared Documents” tab in Sage CRM to emails sent from Outlook. Watch the Working with Classic Outlook Integration video to see it all in action. Two powerful applications working together to make you more efficient and effective!